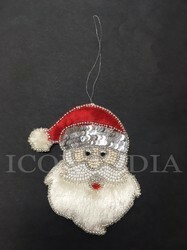 We are the leading Manufacture supplier exporter of Christmas Hanging Santa Claus and Santa Christmas Hanging offered is among the best choices offered that are used for enhancing the look and feel of the home interiors. With these exclusive finished embroidered hangings available in different finish options, these perfectly match up to the demands of the customers. 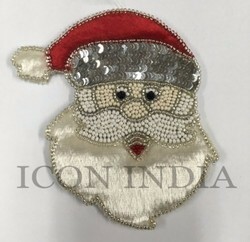 Owing to our in-depth knowledge in this domain, we are specialized in providing Inflatable Santa Claus. Velvet Printed Santa Claus Christmas Cushion, Size: 16"X16"
A combination of Santa with a Candy cane for tree decoration along with a Santa cap makes the ideal gift. Mr. Happy Santa coming out of a chimney to wish you a very merry Christmas with a melodious song playing in the background. A delightful toy to send warm wishes on to your dear ones on Christmas.